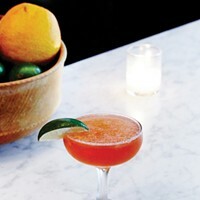 At Gaskin’s, the Ox Eye cocktail offers a smoky mezcal play on the classic margarita. 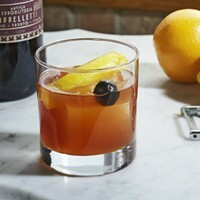 “The Evergreen is a bright cocktail with perky citrus notes and deep, woodsy aromatics,” Worthman says. 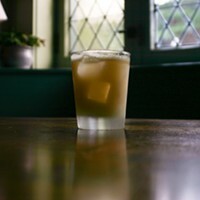 Three Pines Shrub, which forms the base of this drink, is brewed with Balsam Fir, Red Spruce, and White Pine foraged high in the Catskills. These coniferous clippings are infused in organic apple cider vinegar and combined with local honey to create the earthy, zesty shrub. 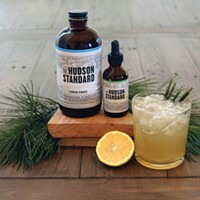 The Hudson Standard's cocktail recipes offer a twist on timeless drinks made with regionally appropriate flavors. 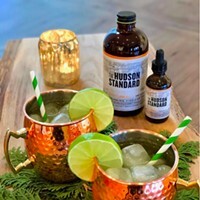 In their variation on a Moscow mule, the Hudson Standard uses a blend of liqueur and bitters to achieve the ginger flavor, plus a pepper-packed turmeric switchel to give it a bit of heat. With flu season sneaking up, it's time to fortify your immune system to ride out winter. 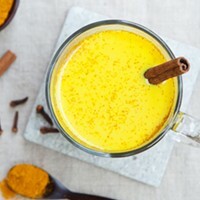 Golden turmeric milk is a delicious (and beautiful!) beverage that boasts anti-inflammatory and immune-boosting properties, antioxidants, and warming effects. 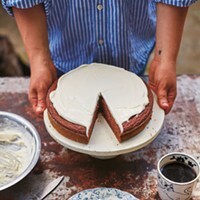 This applesauce cake with cream cheese + honey recipe from Julia Turshen's latest cookbook, Now & Again, combines all the best flavors from fall in one moist, easy-to-make cake that is perfect for holidays. 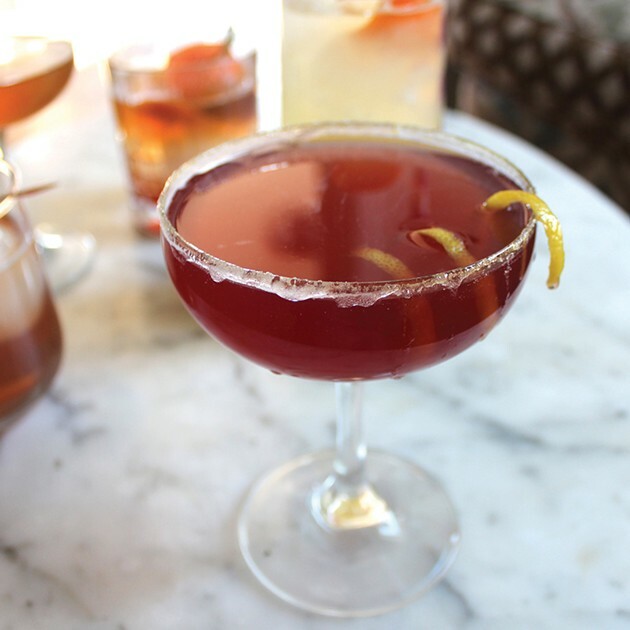 Named for iconic local farmer John Gorzynski, a stickler for traditional methods of organic agriculture, the Ornery Old Fashioned, served at Cochecton Fire Station, is a throwback to the pre-Prohibition glory days of bartending. Midtown Kingston's newest lounge, Lis Bar on Foxhall Avenue, combines Polish tapas and craft cocktails in a cozy elegant ambiance. 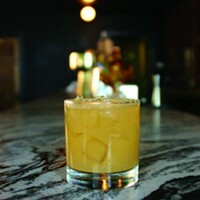 Here is a recipe for Two Streets Down, their twist on a classic whiskey sour. 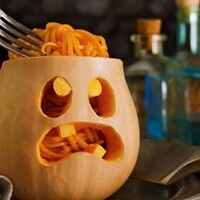 Squash can be a tricky vegetable to put under the blade of the spiralizer, but the flavor and texture are worth the effort in this health-conscious, fun Halloween dish. 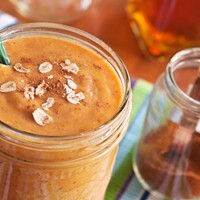 This fall, instead of a sugary pumpkin spice latte make yourself a pumpkin spice smoothie under 10 minutes. This month, Terrapin Restaurant in Rhinebeck, NY celebrates its 20th anniversary. 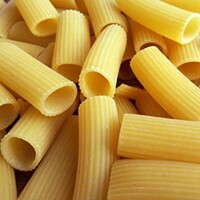 In honor of this occasion, chef-owner Josh Kroner shares his beloved rigatoni recipe. A twist on the ever popular Painkiller, The Indian Summer cocktail has summery influences with a foreshadowing of colder days to come. Eating a nutritious breakfast helps set the tone for a healthy and positive day. Your first meal doesn’t have to be overly complicated to make. 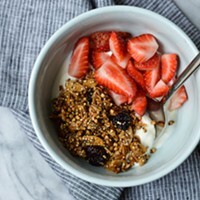 Here are three simple and delicious health-supportive breakfast recipes to kick your day off right. Eat healthy without sacrificing flavor. As part of Sylvia Center's programming, students learn to cook a balanced meals together, such as this vegetable rice and dumplings recipe. Artist and local farm champion Maria Reidelbach is the genius behind the Stick to Local Farms sticker project as well as the local, seasonal cookbook by the same name. 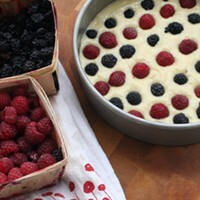 She shares her rich, delicious recipe for a raspberry cake, which can be make with buttermilk or yogurt. 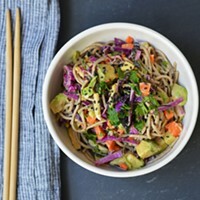 With a rich earthy dressing, seasonal fresh vegetables, and verdant cilantro, this soba noodle salad recipe is a well-rounded in the flavor department and requires very little cooking—perfect for those hot summer days when you don't want to stay long in the kitchen.